If you've found yourself wandering over to the shoe department of your favorite store (we know, how could you not?! 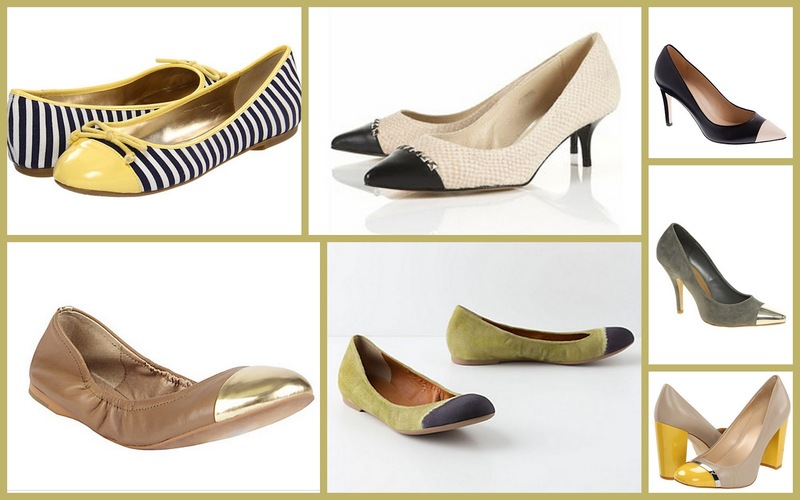 ), you've probably noticed one of summer and fall's biggest trends, pumps and flats with contrasting colored toe caps! Cap-toe heels, flats, booties, and wedges are a must have for Fall. So, when you pack up your strappy summer sandals and peep toes, grab yourself a pair of cap toe shoes to take you from the work day into those chilly fall evenings. Cap toes can be chic and professional in neutrals, soft materials, and classic shapes. But, if your looking for a more edgy and modern look you can opt for a metal cap or bright color to bring out your playful side. There are plenty of styles to choose from to take you from work the the weekend with ease! I just blogged about this cap-toe trend here too. I love the metallic cap-toes! Cap toe shoes design is a nice choice.I like all designs and colors.